The ability for users to bulk schedule tests, assignments, and units has been extended to class-level users. If you are a teacher instructing more than one class and wish to schedule the same assessment, assignment, or unit to multiple classes, you may now do so easily and efficiently with just a few clicks of your mouse. The Bulk Scheduler may be found in the Assessment area of Galileo. The Bulk Scheduler tool in Galileo allows the scheduling of grade-level tests across the district/charter school and may be used for offline and online assessments. The Bulk Scheduler enables a class-level users to extend many of the same testing features that exist on the Class Schedule Test page, such as establishing test times, the posting of scores, access to an online Dictionary/Thesaurus, the randomization of questions, and setting a test password. If a test schedule must be modified, teachers may modify a bulk test scheduler from the Bulk Schedule History page. For more information and resources about Galileo technology, check the Galileo Help files. Launchpads by ATI make accessing and navigating around Galileo K-12 and the K-12 Student-Parent Center interfaces a breeze. 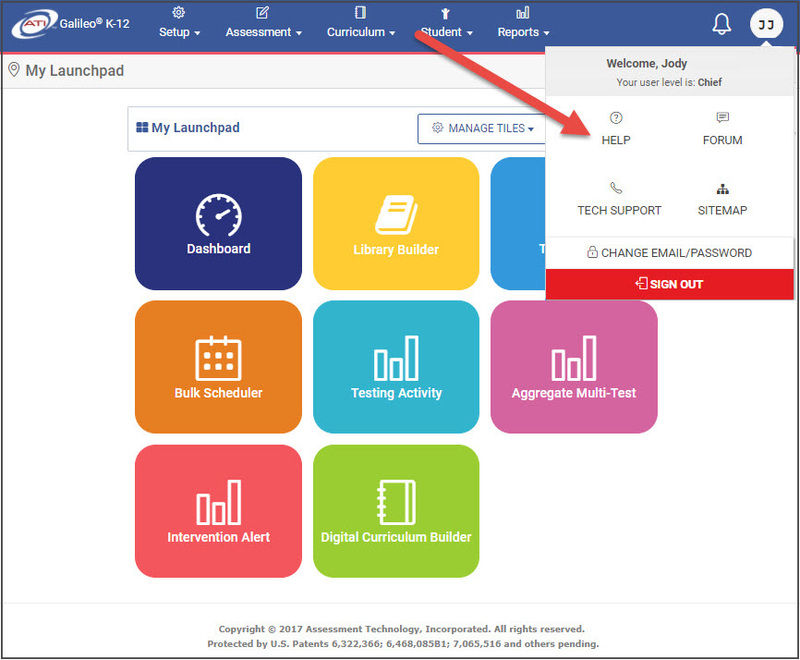 The engineers at ATI have designed the Staff Launchpad for teachers and administrators to drive their efficiency to new levels. When signed into Galileo, the educator will be taken directly to their own Launchpad where they will find colorful, quick-access navigational tiles. The default set of tiles for staff includes commonly used Galileo interfaces (e.g. Dashboards) based on their role as a teacher or administrator. 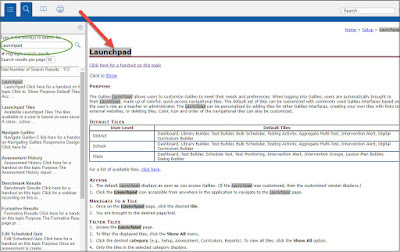 Users can personalize their Launchpad by adding tiles for other Galileo interfaces, creating their own tiles with links to external websites, or deleting tiles. Users can also change the color, icon, and order of the navigational tiles. 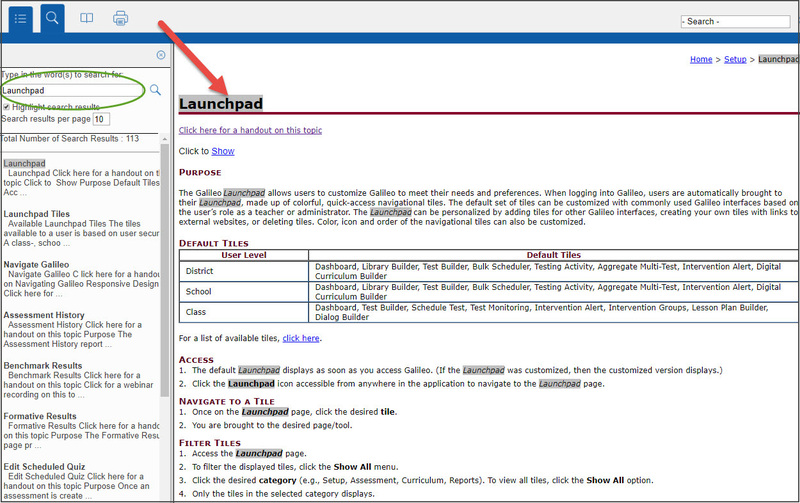 Find valuable resources in Galileo by accessing the Help files and search Launchpads to discover the variety of resources available at your fingertips! Click each image to enlarge. The Student Launchpad offers the same ease-of-use as the Staff Launchpad. 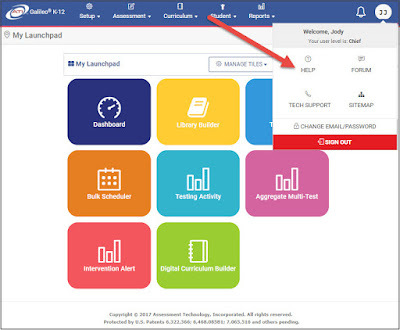 Upon signing into the Galileo K-12 Student-Parent Center, students will find their Launchpad with four tiles providing quick access to the Take Test, Assignments/Dialogs, Test Results, and Calendar interfaces. If you have not customized your Launchpad, what are you waiting for? Check out the resources in the Galileo Help files, access our website, or contact your friendly Field Services Coordinator for a personalized demo on this and other valuable features in Galileo. You can also view firsthand the innovative approaches ATI has taken to make sure you stay ahead of the curve. Register for the complimentary webinar New 2017-18 Assessment, Reporting, and Instructional Tools being offered Tuesday, August 29 at 1:00 pm MST. Access the ATI Community and Secure Item Banks to streamline the creation of a wide variety of assessments including formative, end-of-course, interim, benchmark, instructional effectiveness pretest and posttest. The item banks accessible via Galileo® K-12 offer educators the variety of standards-aligned items required to engage students in complex thinking critical in being college and career ready. District/charter formative and benchmark assessment needs in math, English language arts (ELA), and science can be fully addressed using the ATI item banks. The Inspect® item banks can also be accessed through Galileo. Together the ATI and Inspect® item banks total more than 140,000 items all of which can be available through Galileo. The items within ATI Community and Secure item banks are rigorous and innovative. The item banks provide 19 item types and over 90,000 items in K-12 math, ELA, and science (including more than 16,000 technology enhanced [TE] items). Plus, approximately 800 more items are added each month. The items are written to encourage the use and the development of high order thinking skills. You may be wondering how we do this. Take a look at one of our past blogs that walks you through the item development process and describes the gold-standard multi-tiered review used by the ATI on-staff item-writing experts. ATI continues to expand options for educators such as through our partnership with Key Data Systems to offer the Inspect® Item Bank within Galileo K-12. Inspect® offers more than 50,000 items including K-12 items in math, ELA, and science, as well as items for history grades 5 through high school. History items are aligned to California standards. The Inspect® Item Bank provides access to 14 item types including all item types currently used on statewide tests. ATI Item Banks are searchable and metadata can be used to refine item searches. Teachers have access in Galileo to a variety of powerful metadata for items such as standard, Depth of Knowledge (DOK) level, scoring rules, answer rationales, and IRT item parameters including difficulty, discrimination, and guessing. You can view the metadata along with item content that supports the development of assessments and the interpretation of student results. Metadata can be used to refine item searches and is included with the item content supporting development of assessments. To learn more about our item banks check out our website or schedule an online demonstration with one of our friendly Field Services Coordinators.